Chef Creole, a Miami-based Black-owned restaurant that serves good Haitian food, boasts of successful 26 years in the business and loyal support from the community. Most recently, its owner Chef Wilkinson "Ken" Sejour decided to give back by offering free meals to TSA workers at Miami International Airport (MIA) who have been working without pay since the government shutdown. Last Monday, Sejour have given away nearly 350 meals to federal security screeners, TSA workers, and other employees who were affected by the shutdown since December 22. Those who could not leave their spots had their free meals hauled away by hand trucks or taken out by their colleagues for them. The TSA workers are just some of the 800,000 federal workers that had their pay cut off. Sejour, who said he relies on airport workers for most of his sales, thought that it was just rightful to offer free food when the workers said they couldn't afford to eat there anymore. "These people are here every day. It's not like they don't want to work, they want to work -- they just aren't getting paid," Sejour said. "Today I was honored and humbled to show our appreciation & gratitude to TSA workers affected." The free meals, which included either a griot burger of pulled pork or a fish sandwich of fried swai and a canned soda, is originally sold for $9. With the help from suppliers who agreed to donate food such as 750 pounds of pork, he was able to pull off the charity special. He hopes the giveaway could be able to last as long as the shutdown. 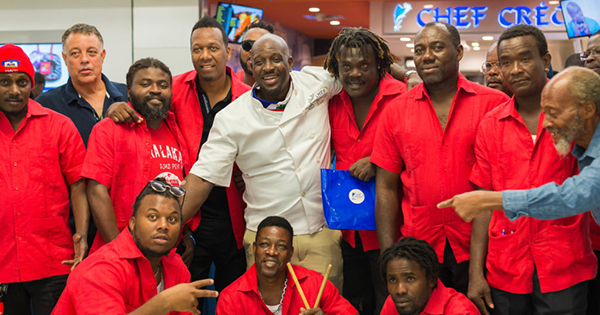 The Chef Creole at Miami International Airport is the sixth and newest addition to its locations around Miami. It opened just four months ago but it has already gained the attention of loyal customers, not just because it features the unique Haitian culinary tradition but also its philanthropic efforts.